1798 Draped Bust dollars represent a transitional year for the series. It was in 1798 that the eagle on the reverse of the coin was enlarged from the motif seen on all earlier United States silver dollars to a more prominent heraldic eagle type whose tail and wing edges nearly touch the rim of the coin. The 1798 Draped Bust dollar, designed by Robert Scot, is also one of the most common issues among all Draped Bust dollars. It also offers a slew of interesting die varieties for specialists who are looking to collect examples of each of the various design modifications made to the dollar over the course of the production run for this issue. Most Draped Bust dollar collectors divide the 1798 dollars into two categories: Small Eagle Reverse and Heraldic Eagle Reverse. 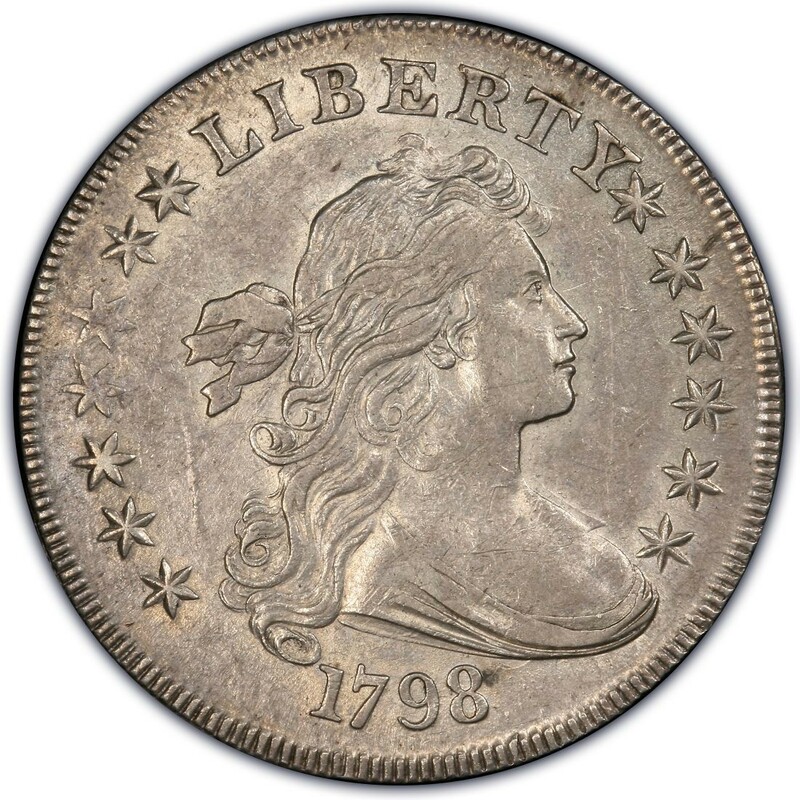 Given the $1,000+ base price tag for any 1798 silver dollars, even those with problems such as holes or signs of a past cleaning, it’s expensive enough to simply collect one, let alone two of these coins. But there are those diehard Draped Bust dollar aficionados who have the money and will collect every single variety possible. No official mintages exist for each of the varieties. Therefore, counting for all of the varieties listed here and any others that still might be discovered, numismatists only know that there was a total mintage of 327,536 silver dollars minted in 1798. While there are certainly varieties that are scarcer than others, this isn’t necessarily reflected in the price trends. Generally list all 1798 Small Eagle dollars grading Good-4 retail for between $1,750 and $2,000. 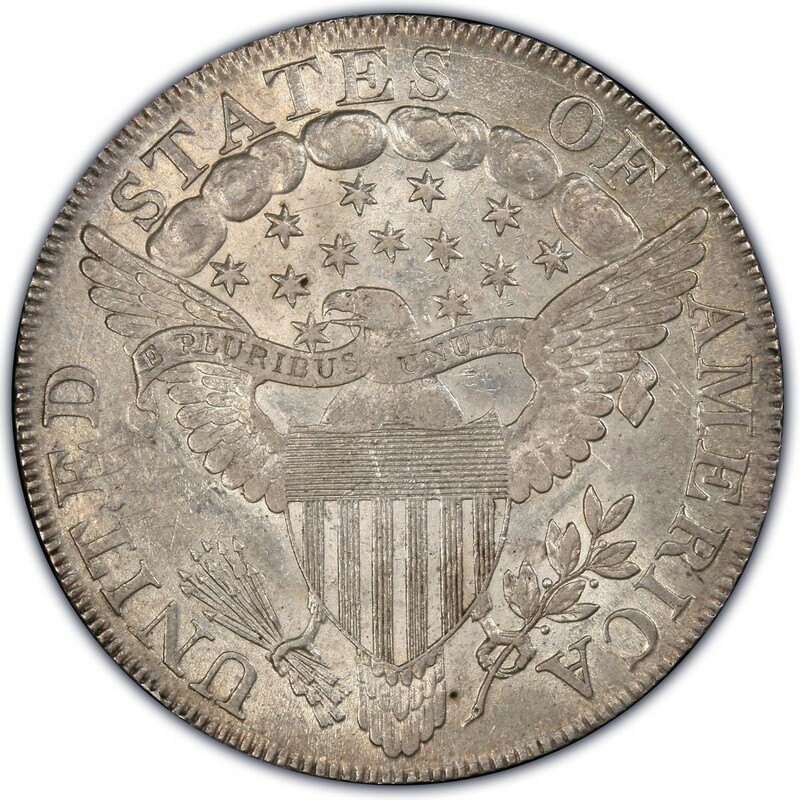 Meanwhile, any of the 1798 Heraldic Eagle silver dollars sell for $1,100 to $1,300 in Good-4.